Rode's new Soundfield mic brings the benefits of Ambisonic recording to everyone, whether you're working with 360‑degree audio or old‑fashioned stereo. Technologies that look dead and buried sometimes enjoy remarkable comebacks. When SOS was launched back in 1985, modular analogue synthesis was already a thing of the past. Who could have imagined that it was also a thing of the future? And who could have foreseen that, 33 years later, we'd all be using ribbon microphones, or getting our mixes pressed onto vinyl? Another technology that is poised to enter the mainstream after four decades on the sidelines is Ambisonics. The brainchild of Michael Gerzon, Britain's greatest audio innovator since Alan Blumlein, it has always had a small band of fiercely loyal adherents, but several factors held it back from widespread acceptance. Ambisonics was poorly understood, difficult to work with in the analogue domain and, above all, lacked a killer real‑world application. Over the years, digital mixing and recording have eliminated some of the technical challenges, but what's really sparked the Ambisonics revival is that the real world has caught up with Michael Gerzon's imagination. Surround sound is now central to the cinema experience, vital for VR and germane to gaming, and what we mean by 'surround sound' is often very different in each case. From consumer earbuds to huge multi‑speaker cinema arrays, there are many ways in which immersive audio is consumed, and no way you could possibly create different mixes for each format. This is where Gerzon's genius comes in, because Ambisonics is designed to be agnostic with regard to listening setups. An Ambisonics stream is an abstraction: it contains all the necessary information about which frequencies are radiating in which directions at what levels, but it leaves it up to the delivery system to translate this information into real‑world speaker signals. That might mean distributing sound across tens of different speakers to create an impressive effect in the cinema, but it might equally mean feeding it through a binaural encoder for headphone surround, or even folding it down to mono for listening on a mobile phone speaker. The key point is that a single data stream can cater for all these delivery formats and many more that haven't yet been thought of. Just as you can mix in stereo using only mono sources, so too is it possible to create Ambisonic mixes by panning mono and stereo sources, and manufacturers such as Avid and Steinberg have put a lot of development work into enabling their DAWs to be vehicles for immersive sound mixing. But Ambisonics also works the other way around. An Ambisonic microphone outputs a stream of information that describes the three‑dimensional soundfield at a particular point in space. This recorded output can then be decoded to simulate one or more mono microphones, pointing in any direction, with any polar pattern between omni and figure‑8 (at least in 'first‑order' Ambisonics) — allowing a single Ambisonic mic to replicate, among other things, any coincident stereo array. The theoretical advantages of this idea are clear. Rather than having to commit to a mic array and orientation at the recording stage, the engineer is free to change these parameters after the fact, or augment a conventional stereo array with a virtual spot mic synthesized from the same Ambisonics stream. A first‑order Ambisonics signal in the so‑called B‑format consists of four components, designated W, X, Y and Z. The first of these represents a measurement of pure pressure, while the other three represent pressure gradient along the horizontal and vertical axes. In principle, therefore, you could create a first‑order Ambisonics array by combining an omnidirectional microphone with three figure‑8 microphones pointing left/right, forward/back and up/down. However, successful Ambisonics recording requires a high degree of coincidence, and it is difficult to position three figure‑8 microphones closely enough to achieve this; acoustic shadowing is also a problem in this sort of array. So, although there exist native B‑format mics such as the Josephson C700S, these typically use only two figure‑8 capsules and thus capture sound only in a plane, not a sphere. In conjunction with Peter Craven, a mathematician specialising in audio signal processing, Michael Gerzon himself pursued a different approach to the design of an Ambisonic microphone. They realised that they could achieve a very tight degree of coincidence by positioning four small‑diaphragm, subcardioid capacitor mic capsules in a tetrahedral configuration. Although the four‑channel output from this microphone — known as the A‑format signal — was not natively an Ambisonics signal, Gerzon and Craven came up with a processing matrix that could transform this into a B‑format signal. Gerzon and Craven realised and developed their invention in conjunction with Ken Farrar at British audio equipment manufacturers Calrec, who commercialised the mic in 1978 using their own capsules. For many years, theirs were the only tetrahedral Ambisonics microphones on the market. Calrec gave up manufacturing microphones in 1993 and Soundfield were established as a separate company, now sourcing capsules from MBHO in Germany. Since then, the brand has changed hands a couple of times, and in 2016, Soundfield were acquired by Australian mic giants Rode. The jointly branded NT‑SF1 under review here is the first fruit of that union. I have been intrigued by the Soundfield mic for a long time, and a few years ago, I managed to track down one of the original Calrec‑made MkIII systems. The first version to reach the market back in the late '70s, it came with an enormous multicore cable and a heavyweight box of analogue electronics that handled not only preamplification and A‑format to B‑format conversion, but also the decoding of the B‑format signal into the mono or stereo array of your choice. One of the inherent drawbacks of this early analogue Soundfield technology is the sheer complexity of the decoding matrices, which resulted in Soundfield mics having a higher noise floor than a traditional stereo array. Since then, there have been several other Soundfield models with accompanying mono and stereo decoders, and potential buyers have also had the choice of various different multi‑channel decoding options. Alongside their all‑analogue systems, Soundfield introduced a range of stand‑alone DSF boxes that combine preamplification with digital B‑format matrixing and decoding, offering greatly improved sound quality and decoding accuracy. As audio mixing and editing have migrated to software, so too has it become desirable to carry out these processes using plug‑ins; numerous third‑party options are available alongside Soundfield's own free Surroundzone 2 decoder. The current flagship Soundfield system is a neat hybrid called the ST450 MkII. This pairs the latest version of the mic with a lightweight, portable analogue processor that provides preamplification, A‑ to B‑format matrixing and minimal decoding functionality. The idea is that the user has enough decoding capability to audition the basic sound on location, before recording the B‑format output and fine‑tuning the results at the mix. For those who don't need even this, however, Soundfield also offer a simpler, phantom‑powered version of the mic called the SPS200. This outputs raw A‑format signal directly into four conventional mic preamps, with all matrixing and decoding handled in software. 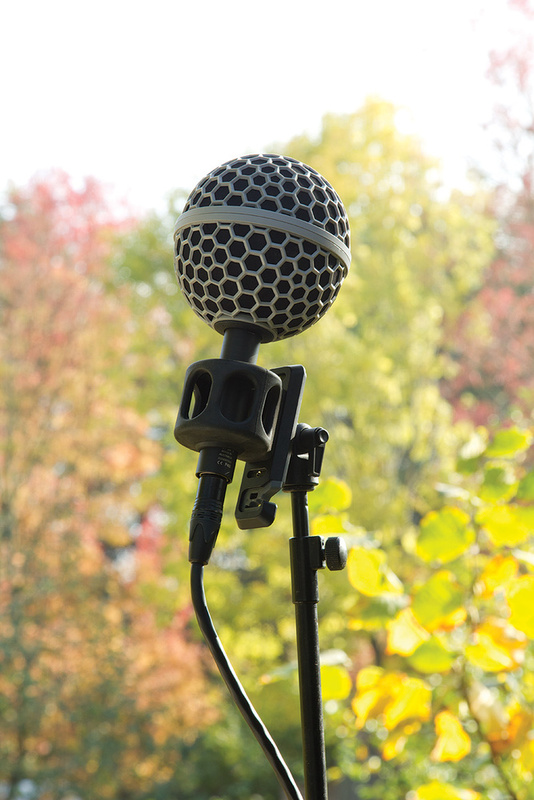 Thanks to the omission of preamps and hardware processing, the SPS200 had the distinction of being, until now, the most affordable Soundfield‑branded microphone. Even so, at over £4000 in the UK, it is very much a premium product, and out of the reach of many home‑ and project‑studio owners. So it's understandable that the new NT‑SF1 has caused a stir, because on the surface, it appears to offer everything that the SPS200 does, for less than a quarter of the price. Now that Ambisonic mixing is already affordable and available to all, could this be the product that does the same for Ambisonic recording? The review NT‑SF1 arrived in an impressive presentation box. Along with the mic itself, this contains a spherical windshield, a doughnut‑style shockmount and a 3m cable terminating in four clearly labelled and colour‑coded male XLRs. What's conspicuously missing is any sort of protective flightcase; the box itself is robust, but it's made of cardboard and is too bulky and inconvenient for anything involving travel. If you're thinking of using the NT‑SF1 for location work, I think you'd want to buy a dedicated case for it. The output from the four capsules of the NT‑SF1's tetrahedral mic array can be processed to simulate any number of mono microphones pointing in any direction. Each capsule's output is present on its own XLR at the end of the supplied custom cable; the decoding is performed in the free Soundfield By Rode plug‑in. The NT‑SF1 is outwardly very similar to the SPS200, with a stick‑like body terminating in a group of four capsules, each with its own housing and grille. This contrasts with the ST450 and other 'hand grenade' style Soundfield mics of yore, which have the 'naked' capsules mounted together inside a single large housing. The NT‑SF1 is thus somewhat smaller than the ST450, but its capsules are, I would think, slightly less coincident. You also don't get the luxury of the ST450's internal heater, designed to keep its innards functioning consistently and free from moisture in extreme environments. 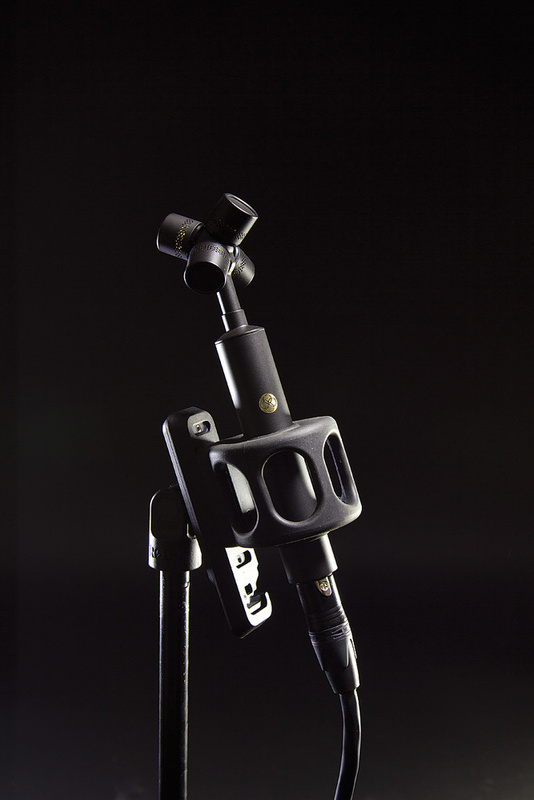 The NT‑SF1 is the first Soundfield mic to use Rode capsules. The TF‑45C capsules in question were specially developed for the mic, and have a frequency response that is flat to within ±3dB from 30Hz to 20kHz, and ±4dB at 20Hz. They are externally polarised, true capacitor capsules, each with its own active electronics drawing 6.2mA from a standard 48V phantom power source. The NT‑SF1 is thus more power‑hungry than some rivals like the Sennheiser Ambeo VR and Coresound Tetramic, which are specified at 3.5mA and 2mA per capsule respectively, with the mic as a whole requiring around 1.2W to function. There is no built‑in pad or high‑pass filter, and a maximum SPL of 129dB is quoted, though what percentage of distortion occurs at this level is not stated. Small‑diaphragm capsules are intrinsically noisier than their large‑diaphragm counterparts, and when four of them are in play, self‑noise can become significant. However, it's not possible to give a universal self‑noise measurement for an A‑ or B‑format mic, because the actual noise level will depend on the decoder settings. For the SPS200, Soundfield give a per‑capsule noise figure of 12dBA; you can't access the outputs of individual capsules in the ST450 MkII, so the 13dBA figure quoted for that mic refers to the noise in a B‑format signal decoded to a cardioid pattern. Rode's specs for the NT‑SF1 list a noise figure of 15dBA per capsule. The NT‑SF1 is thus a noisier mic than current Soundfield models, but not to the extent that this will be a problem in most situations. If you need to record insect footsteps, or very quiet musical sources such as a solo harp, you'll appreciate the lower noise floor of the flagship ST450. If you're recording typical musical sources, ambiences and sound effects, the NT‑SF1 will be just fine. As a rule of thumb, if you'd be happy to use a KM84 on something, the NT‑SF1 should be at least as quiet on the same source. It's also 3 and 4 dB respectively quieter per capsule than the Sennheiser Ambeo VR and the Coresound TetraMic. In fact, if you're likely to use it in rock and pop production, you are more likely to run into problems with the signal being too hot. For the decoding to work properly, it is crucial to use the NT‑SF1 with digital or stepped preamps that allow you to precisely match the gain across all four channels. Happily, this is a feature that is becoming more common on affordable preamps and audio interfaces. However, the sensitivity of each NT‑SF1 capsule is quoted at a whopping 30mV/Pa, and when using it as a drum overhead, I sometimes needed to pad down the input at the mic preamp. This might limit your choice of preamp or audio interface, as not all offer four padded inputs or a wide enough gain range to accommodate the hottest levels the NT‑SF1 can put out. I had the review NT‑SF1 on loan for quite a while, and used it on a varied array of different sources, often putting it up alongside my ST450 MkII to provide a point of reference. Comparing the two side‑by‑side proved unexpectedly difficult: with the appropriate input type selected, but the decoder settings otherwise identical, the Soundfield By Rode plug‑in delivered subjectively different results for both mics. The same polar pattern and angle settings produced a decoded stereo signal that was audibly wider on the ST450 than on the NT‑SF1, and at extreme settings, it was possible to obtain super‑wide stereo effects on the former that weren't available with the latter. In general I felt that the ST450 had the edge in terms of imaging, offering slightly more precise localisation of sources, but there wasn't much in it. Tonally speaking, the mics were broadly similar, but not identical. Using the two mics as drum overheads brought out the differences most clearly, and although I don't think of the ST450 as having a particularly weighty sound, it was able to deliver more thump from the kick drum than the NT‑SF1, and a mid‑range that seemed more solid. By contrast, the newer mic seemed to emphasise the cymbals a little more. If the ST450 has, by design, a very balanced sound, then the NT‑SF1 tilts the scales a touch more towards the exciting rock & roll end of things. There were occasions where this was to its advantage, but also a few times where it verged on the brittle. 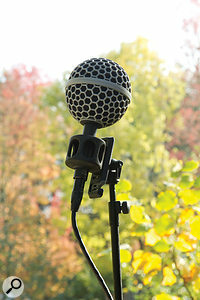 Used outdoors, even the slightest breath of air is enough to generate huge subsonic rumbles from the unprotected mic, but the supplied windshield did its job very well.Used outdoors, even the slightest breath of air is enough to generate huge subsonic rumbles from the unprotected mic, but the supplied windshield did its job very well. It's an impressively heavy‑duty shield, stuffed with fur, and its inclusion adds a lot of value, given that the blimp‑style windshield for the Soundfield SPS200 is a cost option which comes in at over half the price of the NT‑SF1. The shockmount likewise seemed simple, rugged and effective. Sound‑wise, then, the NT‑SF1 is not quite at the level of the ST450, but it gets perhaps 80 percent of the way there at 20 percent of the price, which is a compelling equation, even if you will need to budget for something that provides four matched mic preamps. And the new Soundfield By Rode plug‑in is a big step up sonically, to the point where I'd say the ST450 only maintains its superiority by virtue of the fact that it benefits just as much as the NT‑SF1 from this improvement. In any case, the NT‑SF1's real rivals are not existing Soundfield mics, but other affordable A‑format devices such as the Sennheiser Ambeo VR and Coresound TetraMic. I've not had the opportunity to test either of those products, but the NT‑SF1 betters them on important specs such as self‑noise, and competes well on price. In fact, my main reservations about the NT‑SF1 are ones I'd also have about these rivals and any other A‑format mic, including the SPS200, which is that unless you have a high‑end portable recorder with built‑in A‑format decoding, such as the Aeta 4MinX, you're completely dependent on a software plug‑in (and a host DAW that offers quad tracks or busses, which some don't). If you're using one out and about with a basic hardware recorder, the only useful thing you can monitor is the sum of all four capsules in mono. This corresponds to the W or omni component of the decoded B‑format signal — which is often actually the most helpful thing to listen to when positioning the mic — but beyond that, you're flying blind. It's also unfortunate that the sonic improvements Rode have made in their plug‑in have come at the expense of so much latency. I sometimes use my ST450 in musical situations where it's necessary for musicians to hear the decoded signal live — it makes a brilliant mic for singing guitarists, for instance, allowing you to decode separate virtual mics for the vocal and guitar that are perfectly phase‑coherent — and this just isn't an option with the Soundfield By Rode plug‑in. For this reason, I hope that Rode either keep Surroundzone going or add a low‑latency 'live' mode. Ultimately, the Soundfield By Rode NT‑SF1 is a product that falls only partly into core SOS territory. Many of them will be bought by people working in broadcast, video production and related spheres, and I anticipate it being very popular among those communities. But I hope it doesn't get overlooked by musicians and studio engineers, because the NT‑SF1 offers a new and affordable way to access the vast untapped potential of Ambisonic recording. Its possible use cases are really limited only by your imagination, and go way beyond what's possible with any conventional mono or stereo microphone array. If you've got $£1000 to spend, why would you buy yet another mid‑priced vocal mic when you can have something that does so much more? Any tetrahedral mic is only as good as the processing that converts its A‑format output to a B‑format signal and thence to mono, stereo or some other destination format. 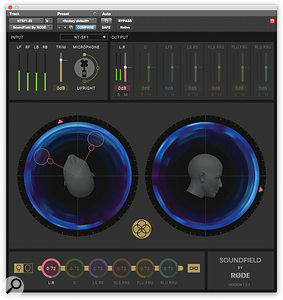 To partner the NT‑SF1, Rode have developed a new decoding plug‑in called Soundfield By Rode. This is free to download from their website, and is by no means restricted to NT‑SF1 users, as it can also work with a B‑format input in either Full Matrix or AmbiX format. Intriguingly, they say that the decoding "operates in a completely different way to traditional Ambisonic processors. Eschewing the matrices and correction filters of previous generations, it utilises state‑of‑the‑art frequency‑domain processing to deliver unparalleled spatial accuracy at all frequencies." 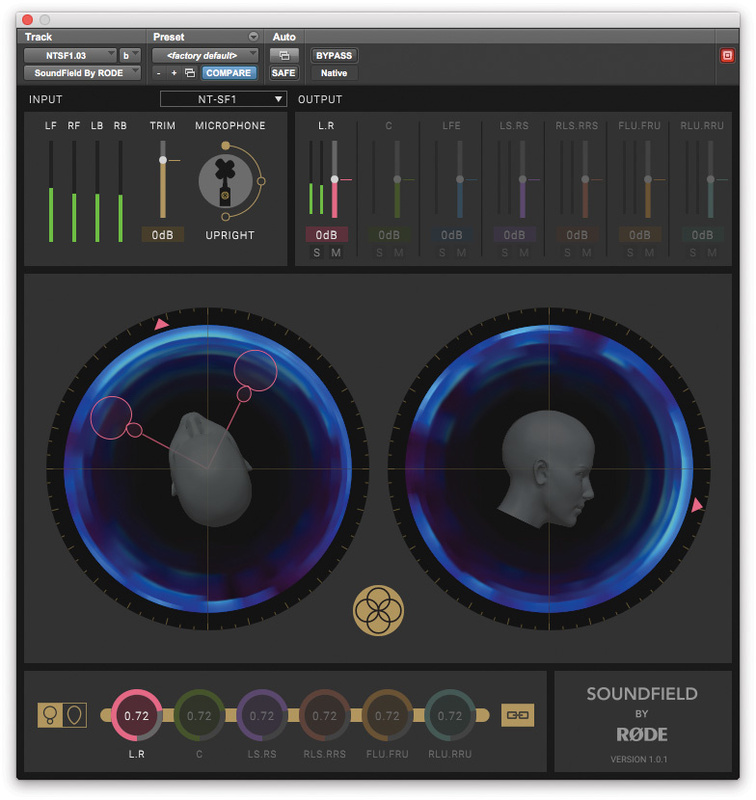 Inserted on a four‑channel track or bus in your DAW, Soundfield By Rode can derive enough virtual mics to create anything from a mono or stereo output right up to a 7.1.4 surround signal. (This, of course, means that you won't be able to decode an NT‑SF1 signal in programs such as Studio One and the 'vanilla' version of Pro Tools, which only support stereo signal paths.) Each of the virtual mics, or pairs of mics, can be pointed in any direction you like, using two circular graphs which represent the horizontal and vertical planes. These graphs have a sort of real‑time spectrogram display around the outside, which shows you the directions from which sound is or isn't arriving at the mic. 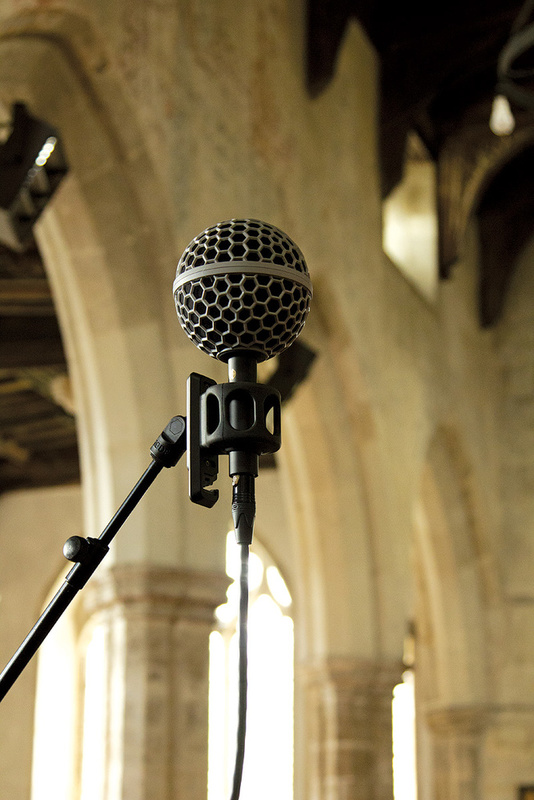 Each mic or pair of mics also has a 100‑step polar‑pattern control, with omni at one end and figure‑8 at the other. The Soundfield By Rode plug‑in.The 'zoom' control found in Surroundzone and in some hardware decoders is gone, but in its place, Soundfield By Rode has a new trick up its sleeve: beamforming. In this mode, you don't choose a conventional polar pattern, but a shotgun‑type response with variable degrees of tightness. The side rejection is not as effective as in figure‑8, but you don't get the rear lobe that is formed with hypercardioid and figure‑8 patterns, and although artifacts can be audible under some circumstances, the additional separation will probably be worthwhile to many. The real‑time spectrogram display is a neat idea, but interaction between the horizontal and vertical graphs takes a bit of getting used to. A source originating to the right of the microphone will show up as a blob of blue and white pixels on the right‑hand side of the X/Y circle, and stays put as you rotate the virtual mics, allowing you to locate it and point towards it. However, what is displayed in the other circle depends on the rotation setting in the first circle, so there's an odd effect whereby the source appears to move up or down as you rotate in the horizontal plane, and when the source is 90 degrees off axis to the decoded mic, it is represented as being vertically above or below it in this graph. In other words, the horizontal axis in the second graph isn't fixed, but follows the rotation setting in the first graph. I can see why they've implemented it like this, and I'm not sure there's a better solution, but it can be confusing, and can make the spectrogram unhelpful in situations where sound is arriving from multiple directions at once. In other respects, I found the plug‑in straightforward to use, and best of all, it absolutely does sound considerably better than the older Surroundzone 2. Compared with its predecessor, Soundfield By Rode seems to preserve (or possibly add!) a lot more information above 4kHz or so: detail is enhanced, transients come across more crisply, and the stereo image in the decoded signal seems clearer and better defined. Moreover, the benefits are not confined to NT‑SF1 users, and it made a noticeable difference to older B‑format recordings made with my ST450 MkII. The downside is that Rode's "state‑of‑the‑art frequency‑domain processing" introduces a latency penalty. The delay compensation readout in Pro Tools Ultimate reported this as being 882 samples, which equates to around 20ms at 44.1kHz. Add this to the inevitable latency of the recording system itself, and the upshot is that it's impossible to monitor the decoded signal without hearing an audible delay. Unless, that is, you also install the older Surroundzone 2 plug‑in, which at the time of writing is still available as a free download and has a reported latency of just one sample. 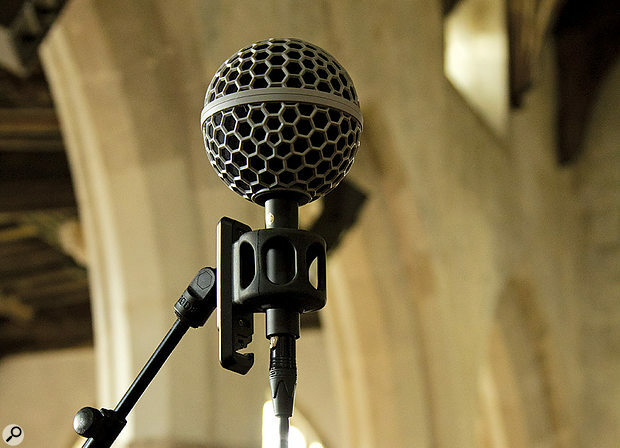 High‑quality Ambisonic recording at less than a quarter of the price of other Soundfield mics. Powerful new decoding plug‑in that is free to download, sounds noticeably better than the old Surroundzone 2 and is potentially useful to anyone working with Ambisonic sources. Requires four matched preamps, and may be too hot for some on loud sources. As with all A‑format mics, the decoded signal can't be monitored except through your DAW. Soundfield By Rode plug‑in introduces considerable latency. 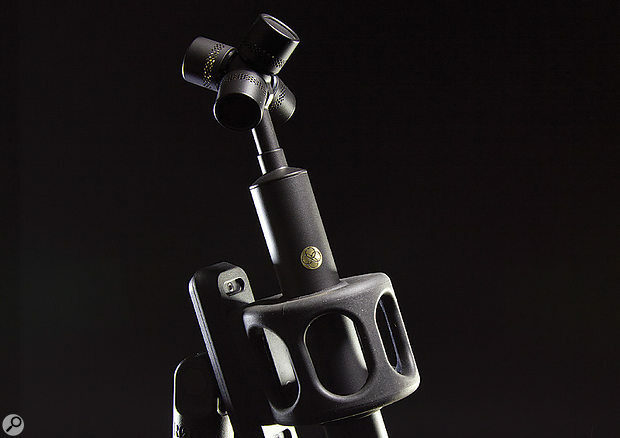 With the NT‑SF1, Rode have set out to create a Soundfield microphone for the masses. By dint of shifting the all‑important decoding into software, they've managed to do so with surprisingly few compromises either to the sound or the functionality, and their new decoder will benefit anyone working with Ambisonics. Rode USA +1 562 364 7400.